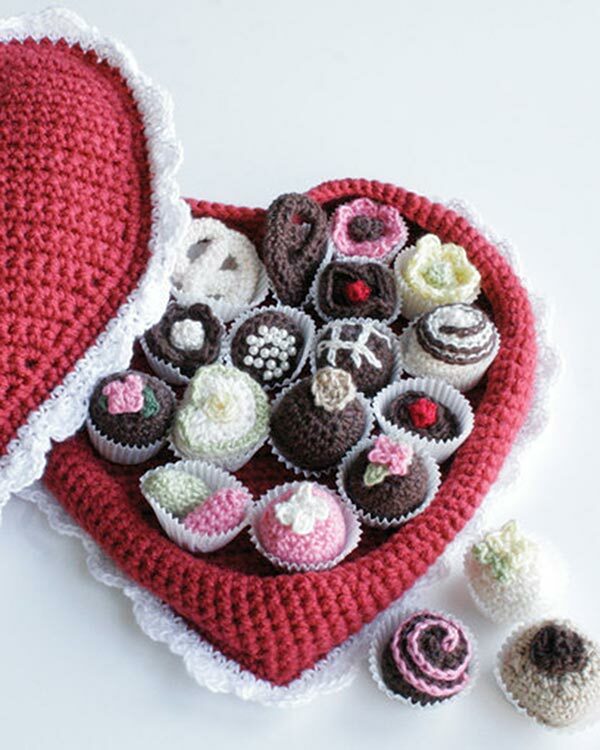 RED HEART® “Soft Yarn®”: 1 Ball each 9925 Really Red A, 4422 Tangerine B, and 9779 Berry C.Crochet Hook: 5mm [US H-8]. Split-ring stitch marker, yarn needle, 3/8” red ribbon. Size: Heart measures 3” tall x 4¼” across widest portion without ribbon. 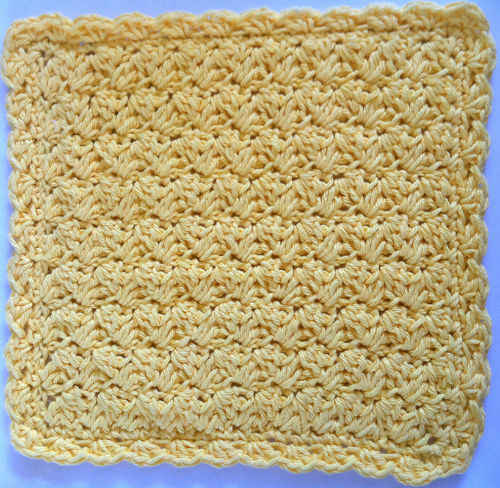 GAUGE: 17 sc = 4”; 16 rows = 4”. CHECK YOUR GAUGE. Use any size hook to obtain the gauge. 3 sc in 2nd ch from hook, sc in next 6 ch, skip next 2 ch, sc in next 6 ch, 3 sc in next ch; turn to work in unused loops of beginning ch, sc in next 6 ch, (sc, ch 2, sc) all in ch-2 space, sc in last 6 ch – 32 sts. [2 sc in next st] 3 times; sc in next 5 sts, skip next 2 sts, sc in next 5 sts, [2 sc in next st] 3 times, sc in next 7 sts, (sc, ch 2, sc) all in ch-2 space, sc in last 7 sts – 38 sts. [2 sc in next st, sc in next st] 3 times, sc in next 4 sts, skip next 2 sts, sc in next 5 sts, [2 sc in next st, sc in next st] 3 times; sc in next 7 sts, (sc, ch 2, sc) all in ch-2 space, sc in last 8 sts – 44 sts. Sc in next st, [2 sc in next st, sc in next 2 sts] 3 times; sc in next 2 sts, skip next 2 sts, sc in next 4 sts, [2 sc in next st, sc in next 2 sts] 3 times; sc in next 8 sts, (sc, ch 2, sc) all in ch-2 space, sc in last 9 sts – 50 sts. Sc in next 2 sts, [2 sc in next st, sc in next 3 sts] 3 times; skip next 2 sts, sc in next 3 sts, [2 sc in next st, sc in next 3 sts] 3 times; sc in next 9 sts, (sc, ch 2, sc) all in ch-2 space, sc in last 10 sts – 56 sts. Fasten off. With Wrong Sides together and A, slip st around, working through Round 5 of both pieces until 1” remains open on Heart; stuff with fiberfill, slip st closed. Fasten off. Repeat Rounds 1-6 with B and C. Weave in ends. Cut ribbon into 3 24” pieces. 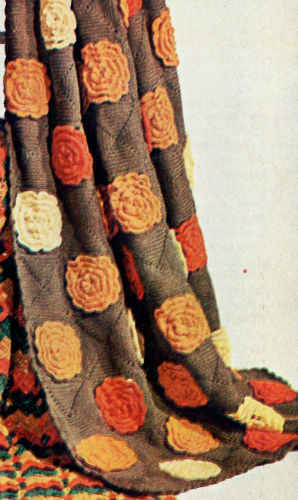 Thread ribbon into top center of each heart and tie ends into a bow. These are so cute. 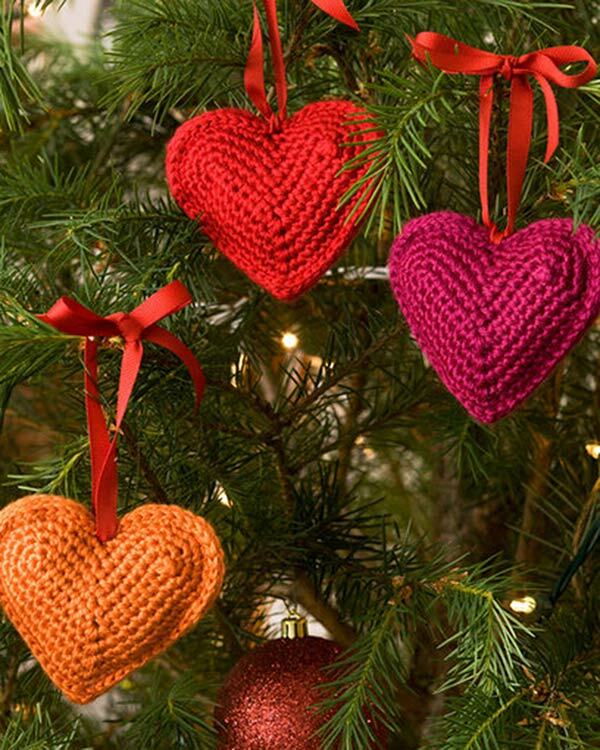 Think I might make each grandchild their own little Christmas tree and decorate with these red, white and green heart ornaments.